Delicate, luxurious dim sum – baked, steamed or fried dumplings and rolls beloved of Chinese cuisine, every one handmade fresh daily - have always been an important part of the menu at Hutong. So popular are they with our guests that in addition to the full dim sum menu offered at lunchtime, when dim sum are traditionally enjoyed, a selection is offered in the evening, too. 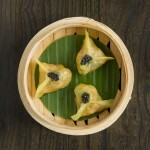 The making of dim sum is a fine art, from the precise crimping technique used to form the folds on xiao long bao – soup dumplings – to achieving the correct translucence of the wrapper on rosé Champagne shrimp dumplings. So we are delighted to welcome Qiu Xin He, a highly-skilled dim sum chef with experience in some of the world’s finest Chinese restaurants, to the team at Hutong. 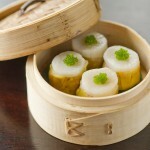 As well as continuing to produce our existing dim sum to the exceptionally high standards our guests have come to expect, Qiu will be introducing a number of new dim sum dishes to the menu, including delicate Scallop shumai (烧卖) topped with tobiko, Black cod rolls wrapped in crispy fried ‘dragon’s beard’ with citrus dipping sauce and Seafood xia jiao (虾饺), pictured above from left to right, which we are sure will quickly become favourites with our guests. 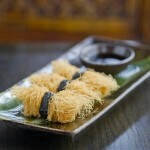 To experience our full dim sum menu, book a table for lunch any day of the week via the About Us page.